It was the quietest existence of all. If I had been on my own I would have made more noise, singing, or talking to myself, but there with you we were silent. And I watched you, as I still watch you now, and eternity ticked by. We stretched and compressed the years and the milliseconds and I wondered if we had wasted our lives. Dr Vincent Alexander spent the nine months of his wife’s pregnancy measuring the light from the stars, trying to construct a mathematical model to prove his conjecture that the astral body moving around the star which would eventually carry his name was not one, but two planets. Certitude of their existence came more or less at the moment our mother went into labour in June 1956. And as the morning wore on we became sluggish. Over the next two or three hours our weight would nearly double and I wanted to lie down, but you continued wandering along the rows of our garden, pollinating the flowers whose heads were already starting to hang low as gravity wrestled them towards the ground. I sat in our afternoon place and my body language said: come and sit, and yours said: no not yet; I’ll be there in a minute. I drank some water because it’s what there is plenty of. I could feel my weight pushing my body to the ground. I could have resisted. I could have stood and run if I’d had the inclination, but I didn’t. Dr Alexander’s only offspring were monozygotic twin girls, my sister and me, Phoebe and Hilaeira respectively, named after phases of the moon, the twins stolen away by Castor and Pollux. Our planets could both be considered moons as each orbited the other. For him they shared our names, but he needed to distinguish the planets from the daughters, so he called them the mathematically more respectable Alpha and Beta, and collectively they were the Leucippides. But we were all his children. So I sat and watched you and there was silence and time passed and we became heavy. The more that was learned about the Leucippides the more our careers were moulded to their needs. These were the first planets proven to be capable of supporting carbon based life, although they were both desert. We were to be the first humans to set foot on them as the personnel of a research station that we would design, build and live in, alone. You sat down. I curled into your arms and your fingers played with my hair, teasing out imaginary tangles. Your fingers told me we should eat before we get too heavy and then we could probably sleep for a few hours. I knew you were right. So I got up and made my way to the store and you followed. We arrived here with seeds and spores of four thousand varieties of fruits and vegetables, flowers, trees, grasses, moss, lichen, fungus, cactus. Dried plankton, frozen spawn of five hundred varieties of fish, fresh water, salt water, pond life. There were seven hundred types of water plant. There were ground worms, invertebrates, multipedes, and lice. Nearly a thousand varieties of insect. All were chosen for their adaptability, their reproductive simplicity and the interaction and co dependence that if carefully managed would create an eco-system. Ten years later there was a biodiversity of nearly four hundred species in our garden, three of which were both sustainable and edible. Food was small, tasteless and lacking in nutrition. We ate potatoes and kale. In terms of space exploration the project was ultra-low budget. We set out in 1982, launched into space on a rocket-propelled shuttle and then jettisoned off on our voyage across the cosmos ‘sailing’ in an ion-drive craft and parachuting onto the surface of Beta twenty years later in earth time, though mentally and physically we had experienced only three years in the craft. After eating we went to the house, which was essentially four fabric and flexi-frame rooms joined together around the virtually unused landing craft which housed all that was technical. Your eyes told me that you were optimistic the maize would flower this time and that meant something different to eat in a year or two. If we had fallen asleep in the afternoon place, by the time we’d have been light enough to do anything, it would have been night and cold, if we’d calculated correctly. You could never be sure. The planets are different sizes. The larger, Alpha, is nearly a hundred and thirty percent the mass of the earth while the smaller, Beta, weighs in at about eighty percent. Beta spins round on a planetary access with a day of approximately nine hours. Alpha stays with one face towards her sister. The planets revolve each other on a moving axis between them in an eighty-nine hour cycle. Together the planets orbit their sun in seventy-six earth days or nearly two hundred and three planetary days for the smaller leaving a year of nearly twenty and a half rotations for Alpha. The tiny star they orbit has about a third of the heat of the sun but, because of closer proximity, early studies implied surface temperatures varying between minus one hundred degrees in the polar regions of Alpha to a cool ten degrees Celsius at the equator. Beta appeared more temperate with extremes between minus twenty and forty degrees. Seasonal changes are not uniform because of the irregular form of the solar orbit. There are two other large stars within twenty light hours of our sun, meaning for half the year it is relatively light at night, the gravitational impact is a cycle of ten rather misshapen solar orbits before coming back to more or less to the beginning. We have data-crystals with kilobytes of information to help predict times, seasons and temperature, but we can no longer calculate the date or even count the days. And then we lay on our backs to spread the growing weight as evenly as possible so as not to cut off our circulation, and in the rhythm of my breathing I told you that I regretted coming here. That I had had enough of being alone, that I wanted to do the things that women do. I wanted a house and a husband and a family. I wanted holidays by the sea and dinner parties for my friends and shopping trips. I told you that I still wanted to be a scientist, but that I wanted to do it on Earth and that I was sad. I wanted to hear music and I wanted to dance. “Shhh,” you said and it was the first sound I had heard you make for so long. I turned my head towards you. You were lying on your side facing me. That must have been uncomfortable. And you reached out your arm and stroked my head so lightly it must have taken all your strength. And your hand told me that our garden was growing and that where we had dammed the river, pond life was taking hold and that if we could calculate a spring like season we could introduce some fish spawn and I remembered that I had eaten most the fish spawn during our first years here, even though it was disgusting. You sighed. Over the years we have given up on the measurement of time. We are not mathematicians nor are we watchmakers. The measurements came to have no meaning, as days of the week and months bore no relationship to anything our bodies could comprehend. The only unit of time became an atomic second and that was used solely for recording research data. We did make vague seasonal comparisons with earth, but we could never imagine whether or not spring was late or winter long. The most incalculable was the effect of our ever changing weight. When Alpha hung over our heads we could jump as high as a house when she was behind us the physical effort of standing was only tackled out of necessity. We must have slept for a long time because it was the middle of the night and our bodies were as light as they can get. I went outside and stretched and leapt reaching up for the large black circle in the middle of our sister; the shadow of our own planet on her. She would have been full and glowing had Beta not been there. 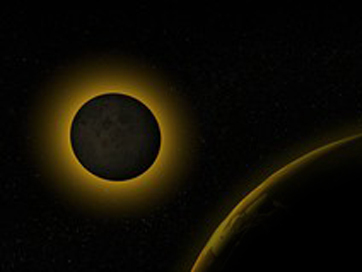 Solar eclipses are frequent and unremarkable. Planetary eclipses on the other hand happen every four days or so and our smaller planet leaves a huge circular shadow on the centre of Alpha. When we were children the doctor would get us to hold up a hoop at arms length to demonstrate how big Alpha would look in the sky, but it’s no preparation for the enormity of that giant object hanging precariously over our heads. I wondered why you hadn’t come out to play in the eclipse. I found you checking the inventory of possible life forms. I had left a tiny quantity of spawn of every specimen, but it would probably never be enough to harvest the fish we both so longed for. Fish and chips and salt and vinegar. Our first year on the planet was spent trying to cope with blood loss as a lifetime of menstrual cycles came and went overlapping and uncountable. We had deliberately allowed ourselves to be guinea pigs, testing the effects of prolonged exposure to extreme gravity change on our hormonal rhythms, but within weeks the bleeding was out of hand. We took progesterone to try and control menstruation but the haemorrhaging continued for twelve months and then stopped forever. We ate through our supplies but we were still malnourished. We dug irrigation canals and sowed the first year’s garden. We over planted hoping for a bigger crop, but we couldn’t find the right growth cycle for most plants and lived off unripe cuttings with reduced possibilities for the next season’s planting (whenever that would be). We started to eat rations of seeds for planting and went back to pens, paper and the computer to make updated seasonal predictions, plan how to better protect the plants from the cold, strap them up to protect them from the gravity as they grew. “You’re angry at me,” I said. You looked at me. No I’m not. I’m just sad. I wanted fish. You floated over to me, your feet gently brushing against the ground, and you held out your arms. We’ve done this together. This is our project. This is our life. The garden is growing by itself. We’ll try more insects. The grass is evolving; look there is more than we ever cultivated. Flowers will grow. Who will tend the garden? You shrugged. Then we heard a noise and everything changed forever. We looked to the horizon and saw nothing for a moment, but the anticipation of turbulence set the hairs on our arms on end and tickled our faces. The echoes of the noise became more direct and rose in volume. What do you think it is? I don’t know. It’s not thunder. No. Then all the reflections were drowned out by the scream of rockets and a craft appeared coming in low and fast over our heads, dropping in pitch as it passed, shaking the garden and racing across the hills out of view and the light perfume of industry and fuel caressed us like a fine mist in swirls and eddies. The roar held its note somewhere just out of sight pausing and sending back vibrations through the ground. Then it cut. We could see dust rise towards Alpha, and we looked at each other. Shall we go and see? No we’ll wait; he’ll come here. Let’s just climb to the top of the hill and look, it’ll be easy. We could be there in a couple of minutes. You go. No, come with me. OK. So we ran in giant strides, bouncing and jumping up the hill because it’s hard to run any other way when Alpha is high. And he came walking towards us. Uncomfortable, unable to judge his own weight, amazed at how each step he was flying just a little, our spaceman had never set his foot on another planet. He knew our names. He was awkward like any unexpected visitor on a deserted planet twenty light years from home should be. “You’re welcome to have a drink, but we don’t really have space for guests. Do you know other people in the area with whom you could stay?” Said my sister, and I was very surprised that she could even remember how to put a sentence together, let alone be funny. I laughed. “Do you have a bag?” I asked. I couldn’t just fall into humour like her. “It’s…” he waved his arm towards his ship. “Er, yes,” he said. So we bounded down the slope and he kept pace with us and marvelled at our nimble movements. He climbed back into his ship and we peered in. It was nothing like the craft that had bought us here and I nearly forgot my manners and asked a thousand questions. He pulled out a case with wheels on it and I held out my hands to take it from him as he climbed down. I spun the wheels with my finger, inquisitive. “They’re so you don’t have to carry it,” he said. I looked at the rocky and uneven ground under foot and then at him, not really understanding. He and my sister laughed at each other and I smiled. I swung it over my head. “It’s not heavy yet,” I said. “I’ll let you know if my arms get tired.” Then I threw it at him and he caught it and laughed when he understood that it weighed nothing. I was funny now too which made me happy. My sister smiled at me, but she didn’t say anything. I took the case back from the spaceman without asking. “So this is your garden,” he said. “You must be disappointed,” said my sister. He came with gifts: a newspaper from 1995 with an article about us. He also had a stock of plants and animal samples to replenish and diversify our garden. He had food to eat: rations for space travel in abundance, and he had bought a bottle of wine from China. We really had nothing to offer him, but he didn’t expect us to. He was astonished at feeling his weight change. “It’s like being drugged!” he said, and we told him to sleep and he did. He slept through two cycles of gravity change, stirring now and then, until eventually we thought it best to wake him as he was getting lighter. “Why do you know so much about us?” you asked him. We were silent. Tears rolled down my face and yours was stone. “Has anything good happened on Earth since we left?” you said. “I know,” he said, “but that one isn’t,” and he pointed to our sister falling behind the horizon. The space man smiled and I took your hand and helped you to your feet. You and I walked arm in arm. He tried to walk with us but excitement pushed him on and he was always two paces ahead, turning and talking. I liked the sound of his voice. We arrived at his ship and climbed up into the cockpit. He fired up the primary power and put the computer into boot. The screen came up with holographic images that were the interface. He pointed at objects and moved them around. In a couple of moments we were looking at a holographic image of our planets. “That’s more than we counted,” I said. He put his hand into the image and pushed us back, out into space. Now look at this. He pulled us in towards the void between our two planets. If we lengthen the frequency we can do an atmosphere scan there’s something amazing that you could never have known about.” The image changed colours and a thread of elastic appeared between the planets like surface tension between two bodies of liquid. “Exactly. There’s an atmospheric link between the two planets. And there’s more,” he said. We tumbled towards the surface of Alpha and the colour changed to shades of green. “What do these colours represent?” You asked. And suddenly I could feel the weight of my body pressing into the seat. The walk back to the garden had us all sweating and out of breath and you and I went inside and lay down. The spaceman sat up though and looked out at the lightening sky. When I woke it was still dark and the spaceman was asleep. You were looking at me. Don’t go, your eyes said. Why don’t you want to? Because others will come prospecting, to make money, to relocate, to repopulate and they’ll bring their power and their weapons. They’ll come to adventure, to explore and experiment, to find, keep and take, and all their fine ideals will dissolve in their creations, in their technology, in their greed. Don’t go. We could stay here. They’ll never come here. I looked at you and tears welled up in my eyes. Let’s walk in the garden, was all I could say. And we walked and brushed our hands over the plants and cut back where leaves had snapped their stems with their weight and we propped up new shoots. I won’t leave without you, but I want to go. The only thing I’m doing here is keeping you company as we both die, slowly, slowly. We would be able to live and work there. We could measure and weigh. It’s our planet as well, our project, our garden. The life there is the life we brought, the life we chose. We could actually send home our findings, they would have purpose and dignity. Our lives so far have been human sacrifices to science. Now we can have a reason to be, we could have personal fulfilment. And yes, they’ll come. But they’ll come whether we’re there or not and if we are there then we can play a part in shaping the future and if we aren’t, we certainly won’t. Do you like him? The Space man? The space man. Er… I see. And you don’t? Hmmm. I think you judge him by his world, but it’s our world too. This is our world. I won’t go without you, it’s just that I’ve spent so long yearning for a life bigger than this garden. I wonder if all I really wanted was to get married and have children. He won’t be able to offer us that. The life we’ve led is so strange and I’m not sure that I ever chose it. I don’t think I chose any of it. The spaceman came out side. “Did you sleep well?” you called through the silence. “I wish I could say that you get used to it after a while, but I’m not sure that you do,” you said and I wondered if you were softening to the idea of leaving. “It’s the only thing that is,” you said and I knew you were going to come. We will always be connected, your hand said as you held my arm. I won’t go without you, and I put my arms around you. You won’t be without me. We’re connected like the invisible elastic holding these planets together. Come with me. It would be weird two pregnant women and one spaceman living on a planet. Too weird. Come with us. Who would look after the garden? Come with us. No. They haven’t come prospecting yet, but he says they’re on their way. Scientists from the European Space Program in China. They have one-way tickets. He says they are good people and that they are coming for good motives. There are two babies in my belly, a boy and a girl, from four different parents, none of them me. I’m to be the mother of a planet, and I look up and stare at you all day through the clouds and the elastic that holds us together and I pray to you and shout out the smell of apples, the taste of fish, the sound of bees, the sight of my swollen belly, the hands of a spaceman, a clever, funny man, and I wonder if you can hear me. I wonder if you’re still there.